Nothing brings more charm to homes in Manassas, VA than well-maintained wooden fences, but even the wooden fences that are not so well-maintained still have a certain rustic appeal. Wooden fences have been around for ages and are still one of the most sought after fences in Manassas, VA.
Have you ever thought about a wooden fence for your home? Wooden fences are a wonderful way in which to provide your family privacy on the outside surroundings of your home. Have you ever hesitated to have a group of friends or a bunch of family members over to spend outside? Did you always decide against the idea because you didn’t want to offend your neighbors if the noise got too loud? Wooden privacy fences also act as a noise barrier for those louder than usual get togethers. Whatever your lifestyle, the professional staff at Hal Co can assist you in the design process, picking out which style of wooden fence, type of wood, and other materials. First, you need to focus on the functions that your wooden fence could serve. All fences serve a purpose even if it is just to improve the value of your property, which is a one of the better reasons homeowners invest in fencing in Manassas, VA. However, in order to design what is functional for your family’s needs, you need to take all things into consideration. Fencing in different areas of your property in Manassas, VA can conceal those eyesores that are necessary to have but don’t necessarily have to sit out for all to see. Maybe you have a wood pile that you would like to conceal from the rest of your yard. Quite possibly, you have an air-conditioning unit or an area where you sit out your trash. With wooden privacy fences, you can conceal these areas of your yard and give your landscaping a fresh, clean look. Whatever you are trying to enclose with a wooden fence, rather it is your property line, a backyard area to protect small children and dogs, a pool area, or just a few eyesores you have around the house, call Hal Co Fence and our professional staff can assist you in the design process all the way through to the complete installation of your wooden fence. 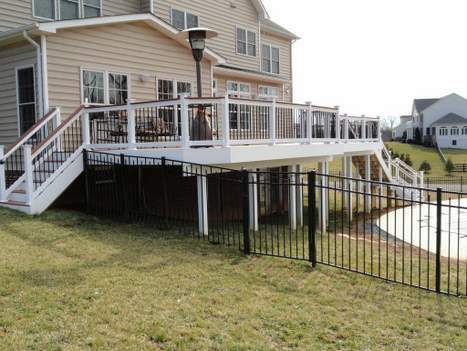 Adding fences to Manassas, VA, landscapes is an exercise in creative design layered with legal regulations and other often overlooked planning considerations. Here are some details you may want to take into account before you begin planning your new fence. Fences serve multiple purposes – security, privacy, access control, boundary delineation, and decorative ornamentation. Weigh each carefully against the legal specifications and other regulations to determine which type of fence style and which materials will best serve your needs. If you live in a community with a homeowner’s association be sure to check on their stipulations as well. Compare costs on a lifespan basis, adding in time and materials for maintenance. Oftentimes people find their total cost can be significantly lower when investing in higher performance, top-grade materials. This can be especially true if your property experiences issues with drainage, runoff, and erosion following intense storms that can accelerate damage to fences in Manassas, VA. When exploring fences in Manassas, VA, look for features, styles, and materials you may be interested in learning about. Having a photograph or two of your property and home may help you visualize attractive candidates. Taking a photo of the fence or feature that interests you can help you share details with your fence contractor. A family owned and operated fence company, Hal Co. is a name that has meant high quality and dependability in fences from Manassas, VA, to Washington, D.C., since 1981. Visit our website or give us a call and learn why Hal Co. has a long-standing reputation for outstanding service.